Nearing the end of the second century CE, the once mighty Roman Empire was in severe decline. In the year 193, Pertinax was appointed Emperor, succeeding the previously assassinated Commodus. The new leader’s reign was to be short-lived however, for his Praetorian Guard quickly became displeased with him and struck him down. This created a power vacuum, signaling an opportunity for the great families of Rome in their quest to seize power. Donning the Purple places you into this world, as heads of powerful families vying to don the purple toga (Trabea), in an asymmetrical king of the hill battle for supremacy. Only through smart planning, good timing and a bit of treachery will you prevail. Donning the Purple is the second title from Tompet Games, and launches on Kickstarter next week. The game thrusts you into the nebulous maze of Roman politics. Challenging 1-3 players to manage an ailing empire, while forging and breaking alliances, as they weave their way to the pinnacle of power. The threats of your opponents are not your only concern, for you face trouble from without, as well as within. While emperor, you must deal with faceless enemies massing across your provinces, famine laying waste to crops, and a constant stream of natural events that are intent on ruining your reign. During the game, each player assumes a role within the government of Rome; either as emperor, the emperor’s heir, or senator. Aside from a starting bit of coin, players also receive plot cards to play from their hand for various benefits. Hidden agenda cards are assigned to each player, proposing a secret task to complete for more victory points, and these can be huge. The end goal is simple, accumulate as many victory points as possible through the game’s four rounds. Points are scored along multiple paths, and those hidden agenda goals can really swing the tide in your favor in the final scoring. As you would expect, the surest way to score VP’s is by being emperor. The emperor not only gets one more action (3) than other players (2), but also has other special actions to select from. That is, if you can stay alive and on the throne long enough. If you die, fret not, for death is not permanent in this game. When you die, that only means the current family patron has passed into Elysium, and you can reset and carry on as their successor. If you are the current emperor, you will lose your position, but that role changes hands quite often throughout the tumultuous four turns, representing years in the game. Through cunning and well-timed maneuvering, you can once again regain the Trabea! At the start of each turn, invading enemies appear in random locations and begin their march on that region’s capital. This perpetual invasion advances each turn and moves even further through event cards, with simple combat outcomes determined by overall strength. If all four regional capitals fall, or if all enemy cubes are on the map at once, the game immediately ends. These are a couple of the ways that the game forces cooperation among the players, as equally as it promotes direct conflict. Then the harvest level is determined, telling you how well you can feed your people at year’s end. Five event cards are drawn by the emperor and acted upon, setting the complexion of the board for the turn. Events pose all manner of troubles for you as emperor. Your Praetorian Guard will extort you for more money, pushing for higher donativum on more than one occasion. Opponents will gain random benefits, senate shakeups will take place, grain shortages will hit, and a host of other events keep things on shaky ground. I found the random events both frustrating and fun. As emperor, the event cards have a bigger impact on your progress than for your opponents, so setbacks will make your job more difficult and can also remove stamina. With a lowered stamina level, you’re a ripe target for your opponents. This really tests your ability to provide for the safety and well-being of the realm, while also trying to build personal wealth. Although frustrating, this also makes it quite fun because you are forced to make tougher decisions with your limited capabilities. You’ll need deep pockets to train more legions, build monuments for strength and victory points, bribe senators, and maybe even convince an opponent not to attack you. Personal bribes are not covered in the rules, but the game’s theme is sure to bring this social aspect out. Don’t expect your coin to always be honored; alliances are fleeting and fickle in Donning the Purple, and treachery is the name of the game in ancient Rome! Stamina is the life blood of your patron, literally. It is the currency that you spend to carry out the actions during their ‘life’. You begin with 11, and actions costs one stamina, but more can be lost through events and assassination attempts against the emperor. Not only will the emperor suffer stamina losses, but so will every player. Sometimes it’s not in your best interest to strike when they are weakest, but instead letting them do some of the heavy lifting that can make ascension to the throne easier. Timing is everything. Each player pawn represents their personal army, and can move up to three spaces, with a strength of two. This strength can be increased permanently through investing stamina in Forum cards, or temporarily buffed by Plot cards. It’s easy to forget this pawn as you concentrate on building estates and monuments, since they bring in cash and victory points. Don’t overlook the pawn, your army can make quick work of the enemies in multiple provinces quickly, gaining extra riches, plot cards, and even regaining stamina to extend your life. Hispania reconquered with white player pawn buffed by 3 strength Plot card! Although player actions are limited, they are augmented by a copy mechanic. Several actions allow other players to follow suit, and take the same action as the current player, out of turn. This keeps things moving along nicely, practically eliminating downtime. I’m a big fan of the copy mechanic, especially in shorter games where minimal actions can feel limiting. It’s a smart design choice for Donning the Purple, as players average between eight and twelve actions per game, depending on their roles. Plot cards are dual-use, either for the effect or their strength factor. Effects can be beneficial to you, such as getting an extra action, earning a free senate seat or moving the coveted heir token to anywhere you like. These are free to use at any time, during any players turn. The strength factor on the card can also be used to increase your assassination rolls against senators or the emperor, increasing your chances of success. Likewise, they can be used in defense, to mitigate the effect of the attacking player’s roll. Remember when I talked about timing being everything? If you’re the final player on the turn and send the emperor to his demise, you can steal the heir token and reap the rewards of the tax collection phase. That can provide a financial windfall, if timed right. Be aware that there are two of those cards out there, so someone could easily use theirs in response to your play and take it from you. Ahh, sweet, sweet treachery! The senate is another angle not to be overlooked, as it controls the building placement queue. When you choose to build estates or monuments, the leading senator may swap any two buildings in the queue, and only the first four buildings can be placed that turn. That is quite a powerful ability, and a way that you can hamper another player. Offering bribes to move your buildings up in the queue can be quite lucrative for the senator, but it can also lead to them becoming the target of an irate aristocrat. Senators can be easily eliminated with a simple die roll, thus costing them their power seat. This is another bit to this game that I really liked, because it expands the social interaction and momentary alliances, bringing the feeling of Rome firmly to the tabletop. Senate connections can get your buildings moved up in the queue. It’s not unheard of to see two or even three new emperors in a round, especially in the final round where hidden agenda’s need to be met. It’s paramount to never let your guard down, and to maximize your efforts to always be scoring. This is where the game’s strength really lies, not only in its simple but clever facets of threat and financial management, but the need for constant strategic alliances. This is not a multiplayer solitaire game, turtling will just make you a target. Don’t be a target! Not only is this a very fun multiplayer game, Donning the Purple also has a solid solitaire option as well. After removing select cards that are specific to multiple participants, you’re left with the cards that beat up on the empire and in turn, the emperor directly. You’ll see wild swings as famines and enemy troops stack up quickly, and capitals fall much faster in solo mode. You can clear them out almost as quickly with good placement of your legions and leader pawn, and make sure to build aqueducts to fend of famine. At home, you’re dealing with an increasingly powerful senate whose power grows exponentially if left unchecked. Even in solitaire mode, there’s a lot to consider. 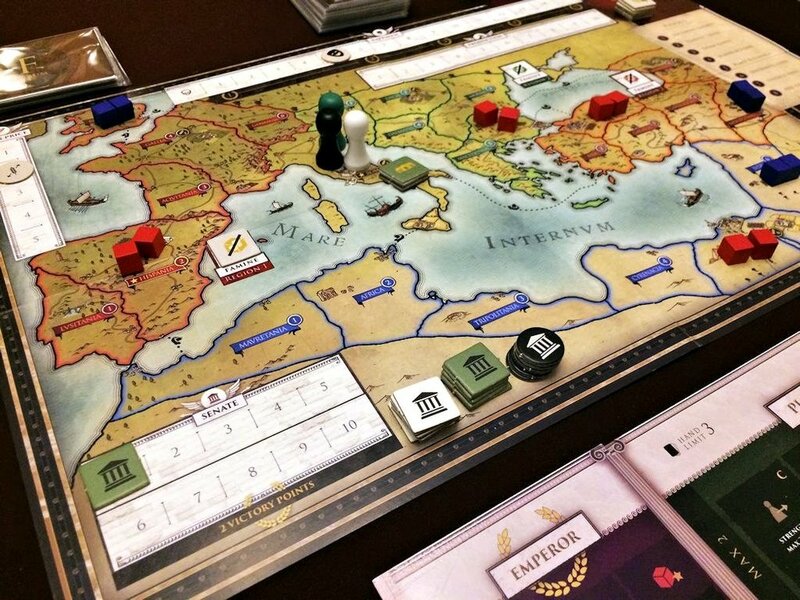 I very much enjoyed my plays of Donning the Purple, and found it a very entertaining game that captures the flavor and political intrigue of the Roman era quite well. It’s abundantly thematic, and the streamlined nature of the game and light ruleset, belie its strategic depth. It has a similar feel to a state of siege game, with the constant pressure from numerous, persistent threats. For the emperor, this game is all about balance and defense. Balancing the well-being and happiness of the people, while defending the realm and your throne from invaders and usurpers. For the other players, you must balance your actions and finances to time your moves for maximum effect, while colluding together in your quest for the throne. The strong level of direct player conflict is balanced by the need for cooperation; either for personal survival, threats to the realm, or those driven by hidden agenda cards. Alliances will be made, some will be honored and others broken, but you’ll definitely have fun on the journey! Rounds move quickly, at about 20 minutes or so for your first go-round, but will decrease with experience. The copy mechanic nearly eliminates downtime, keeping everyone engaged and entertained. Of course, that can change with AP prone gamers, as they try to calculate their optimal move, but there isn’t a tremendous need to spend time hyper-analyzing each play. Event and Plot cards will derail schemes often, forcing you to adjust your strategy. If you like intrigue, political power plays, and shifting alliances neatly packaged in a quick-playing game with an epic feel, Donning the Purple is one to check out when it hits Kickstarter next week!